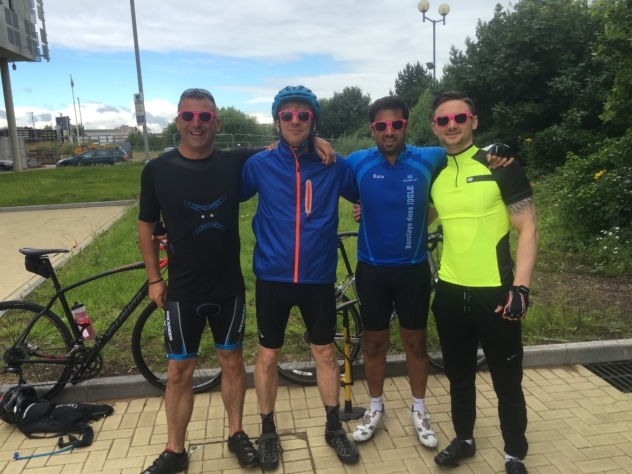 Four members of the Barclays Eagle Lab team have set off from their regional base at Innovation Birmingham Campus, on a three-day charity cycle event from Birmingham to Brighton. The team will cycle over 500 miles in aid of four charities including Unicef, The Hope Foundation UK, St. Luke's Hospice in Winsford Cheshire and the Jubilee Sailing Trust. They will begin their journey from the Birmingham Eagle Lab, visiting their Bournemouth and two Cambridge labs, before finishing at their Brighton Eagle Lab later this week. The cyclists include Director of Eagle Labs and Digital Eagles, Dave Shepherd; Head of Eagle Labs Implementation and Run, David Hamilton; Business Development Manager, Ketan Trehan and Head of CX and Design, Jack Williamson. Dave Shepherd, Director of Eagle Labs and Digital Eagles, said: "We will be doing a tour of our five Eagle Labs, travelling over 500 miles from Birmingham to Brighton via Cambridge and Bournemouth. We are hoping to raise as much money as possible for our four chosen charities – Unicef, St Luke's Hospice, the Hope Foundation and Jubilee Sailing Trust. Barclays will be match funding all donations we receive and you can keep up to date with our journey by following #TourDeLabs on Twitter." Barclays are one of five commercial partners currently on Innovation Birmingham's Serendip Smart City Incubator; a programme which co-locates promising start-up businesses with large commercial partners. These commercial partners help to mentor the qualifying early stage tech companies, providing a unique support package which encourages the development of new products and services.